This post will be short and instructional and deal only with the Standard and Poors 500 Stock Index for now. Many commodities face similar conditions of uncertainty, but I will deal with them as they come (and I will attempt to get one done this week again on WTI Crude Oil ($CL_F). 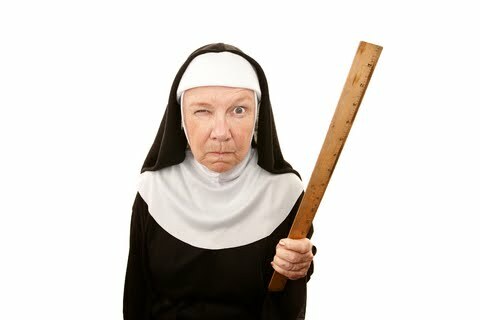 I put the image of the Catholic nun threatening a hypothetical Catholic school student with her the wooden ruler to remind you of the importance of trend and why having discipline in measuring that trend is essential to ANY trading for investment plan. What I am about to discuss is one of the basic (yet often forgotten) principles of technical analysis of financial instruments. That principle is as follows: If you want to know what the current overall trend in a market is, the most imporant tool to measure it is WITH A RULER. As a side note, I never went to Catholic school. I was a victim of the Greenville County (South Carolina) School System. No nuns were used, but in my junior high school Geometry class there was a gentleman by the name of Mr. Ledford who was deadly with a piece of chalk from anywhere inside of 30 feet, and was known (before I got to his class) for beaning sleeping students with a half-deflated tennis ball, if that were available. He would have been convicted of some form of child abuse in this generation, I would imagine, but we never seemed to have problems in our classroom. He was a big guy and he wouldn’t put up with anyone’s (using polite English) defecation, if you know what I mean. Now, back to the discussion. After hearing all of the noise about the the $SPX (Standard and Poors 500 Stock Index), one would think the entire universe had just collapsed and that death and destruction would soon follow. You probably feel that way if your local “safe money” advisor/broker just got through explaining the horrors of the past week. That person has to eat too, so the ad budget had to increase over the last three weeks. As you can see from this monthly chart, however, we really did not crack a long standing trend, but actually made a higher low in a two-point trendline. To emphasize the monthly chart a little more, take a look at the green and blue trendlines. Notice that the evidence of the high price acceleration trendline ( in green with two points) bounced of a current trendline for now when the higher low was not breached during the first week of September. In the very short run, that higher sloping (and higher price acceleration) trend line is still intact. The last two points (that include higher lows) runs along the blue line. There is a worrisome element in that chart though. The last candle (ending the week of 09/04/2015) is red or bearish. Momentum on the weekly chart is STILL NEGATIVE. The lowest near-term low has held so far, but on for the week, price momentum is negative, just like it as in the previous couple of weeks. There is still at least a CHANCE that prices will continue lower. It also stands to reason that in a worst case scenario that the market could at some point reteat that higher high on the far left side of the chart. The reason for that is that previous price resistance (which occured in 2008) could act as price support when prices fall (as they inevitably will over the course of time an market cycles). Is that really what is about to happen? I think the best thing we can do is to reduce the time frame to weekly to see the full effect of the price decline’s damage to bullish (upward) price momentum. You can see from this chart that two bullish trend lines have been broken to the downside, and that the first lower low established at the end of August is still holding on. The candles, which have wicks, are still red, meaning price movement continues to be bearish. What is left to do from there is to look at the daily chart to see if there are developing patterns that give way to what could be predictable price action. If you click on each of the following links, you will see the bullish case (which is not quite all that bullish at present), and the bearish case. Bullish case: In the very near term, if the low created mid-week last week at 1903.07 holds, symmetry suggests that we could end up with a high in perhaps 7 days at approximately (1993.48 -1867.02)+1903.07, or 2029.53. Note that such a high would all but close the price gap at 2035.73 that occured at the end of session on 8/20/2015. For that reason, one might expect the gap to close at 2035.73. If we do not exceed that price and we begin to see another rollover, we would again be likely to retest at least the 1903.07. After that, the sellers and buyers will have to drive the action. We could go higher, but not until we see 2029.53 blown out to the upside. The pattern is in effect a BEARISH XABCD Fibonacci pattern that COULD fill a price gap. Bearish case: The bearish case could be a lot uglier. If we break below the 1867.02 price support, it sets up a minimum retest of the previous 1821.61 low of October 15, 2014 and the potential for a low of 1993.48 – (2130.36 – 1867.02) = 1730.14. (There is a slight inaccuracy in the down trend line shown in this chart, but the math is good ). If all this holds up, and you are a long-term investor, not so much worried about value, but time, this would appear, if the rally continues to be a mere bump in the road. John Hussman, who is known for calculating present and future values of stocks on a forward basis, however, continues to echo concern about longer-term value, as stated in this piece. Note in particular this chart. The upshot of that chart is that on a value basis, there is little statistical evidence of any positive return in total return of the $SPX in the next 10 years. If you are a long-term investor and have 20-40 years to continue investing, then you can probably ride out a bump that could extend perhaps to 38 to 50% price drop that one might expect over that period, assuming you were diversified and were adding money over time, allowing the dividend yield to buy more over that same time period. If you are at or near retirement, you might want to reconsider exposing yourself to such a correction if it were to occur (and odds are, they will at some point in the future). By the way, this is in no way any endorsement of Hussman Funds or John Hussman personally, it is just that his track record of analyzing such trends has been really good. That perspective and choice is yours to make (and you should be fully aware of your age and your risk tolerance in making such decisions). Futures seem to indicate a strong rally for Tuesday morning, so we will have to watch. CL_F seems to have held $49 and change, and is trending lower once again. More on that later. Once again, thank you for supporting this blog! More will be coming soon! Next post: Report From The Trading Bunker – After The First Wave Of Bearish Invasion… Is VOYA Worth Looking At? Previous post: What’s The Neural Net Model’s Verdict on $SPY And What About $CL _F?